Education is a basic right in Bangladesh. Even so large percentages of children all over the Bangladesh are far away from having their right. To fulfill this aim east west environmental & social club had lunch primary education program named Poruyader Ashor. With the motto “to eradicate illiteracy”, Poruyader Ashor provides all local and disadvantaged kids with an opportunity to get quality basic education .it is managed by student volunteers of east West University and occasionally supported by individuals and organizations. 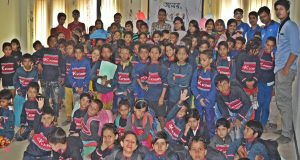 When EWU shifted to its permanent campus at aftabnagar, Rampura in May, 2012, the club moderator SSM Sadrul Huda noticed local children loitering around. The idea of such a non-profit school for these children came to him. In the beginning, this project was run at the career counseling center lobby. Dr. Mohammed Farashuddin, chairperson, Board of Trustees, helped to make the project move forward. This small project is now complete school with 40 students. On 1st November 2016, the school shifted to separate building under the name “East West Biddanikaton”. The school is now entirely funded by East West University. However, the student of EWU still voluntarily teaches the student without pay. The current principal of this school is Brishty Dutta. Several student of this school are enrolled in formal education institution and performing well. On the prospect of developing country like Bangladesh, a non-profit institution like this is much needed and appreciated. There is no alternative to education in order to develop nation. This education must be provided to all children, regardless of class. Writer: Kazi Anika, Student, East West University, Dhaka.